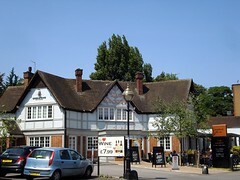 A large Greene King pub in Eastcote, the largest near the station (though there are several bars). Previously known as the Manor photo, it was refurbished in late 2011 and renamed to the Ascott. Entry is into a large clear space in front of the bar, presumably for standing-up drinking purposes. Seating is provided at high and low tables in a number of different areas. There's plenty of space, but it's rather dark even when it's sunny outside. Outside is a large patio area overlooking the busy main road. While the refurbishment did away with the pool tables and dartboard, it did bring in a number of handpumps, which on Kake's July 2013 visit were clipped for Greene King IPA, Old Golden Hen, and Abbot Ale. They also had Peroni and San Miguel lagers on tap. A pint of lime and soda was £1.20. Food is served from what appears to be a standard menu across this sub-brand (Greene King Flame Grill). In April 2009 (before the refurb), Ewan's ploughman's cheese sandwich with pickle (around £3.50) was perfectly tasty and competently put together with an option of either white or granary bread, and decent crispy chips were available for an extra £1.35, though there was a special offer with the sandwich, chips and a Coke for about the same price. Service was friendly, and cutlery and condiments were brought out before the food. Accessibility: No steps to get into the pub, and it's step-free to the bar, toilets, patio, and most if not all of the interior seating once you're in (though there are two heavy doors to get into the ladies', and the cubicles are quite tight). Some of the seating is on high stools at high tables. There was a separate accessible toilet before the refurb, but we haven't confirmed that it's still there. Last visited by Ewan and Jo, April 2009. Food times taken from a sign on the door, April 2009. Last edited 2014-10-22 08:26:05 (version 7; diff). List all versions. Page last edited 2014-10-22 08:26:05 (version 7).